This is the story of Edna Manley, wife of Norman Manley , the Jamaican leader who brought the country its independence. 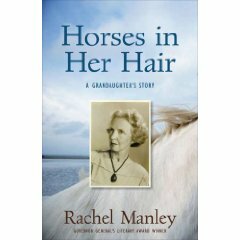 It is written by her granddaughter, Rachel Manley, who was part of her grandmother’s life both in England, where Edna was born, and later in Jamaica where Edna went when she married Norman Manley. Edna was the daughter of an English missionary who had served in Jamaica and married a West Indian girl. When Edna married ,she was returning to her mother’s country, which she had heard about in glowing terms all her life. The book gives a very perceptive picture of the coloured race in the Caribbean and how it gradually got a grip on power that had been British. Edna is very much part of this, as would be her two sons. But she has another whole side to her: she is an artist and sculpts in wood and stone – pieces which make her name in Britain as well as in Jamaica. The book illustrates this work; one of the most striking is called “Horse of the Morning” carved in wood. She also initiated the island’s first literary magazine and won the love of writers and philosophers throughout the Caribbean. Her granddaughter Rachel has an impressive literary career of her own. She serves on the creative writing faculty at Lesley University in Cambridge, Mass. and has won prizes for her poetry, as well as Canada’s Governor General’s Literary Award for “Drumblair: Memories of a Jamaican Childhood” and “Slipstream: A Daughter Remembers”. She divides her time between Toronto and Jamaica.